Are your remote workers hard at work, doing someone else’s work, or hardly working? You need the proper tools to effectively manage them, monitor their performance, and keep them fully engaged. 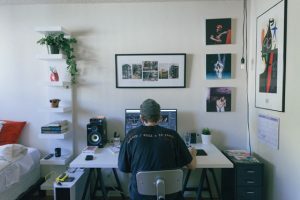 An old song has been constantly playing in my head since the last interview I conducted with a remote worker who was seeking a new opportunity. The applicant was top of the line, I was hoping against hope that we could hire this person. Then the shoe dropped … they had a “situation” that needed to be agreed upon before they could proceed. The applicant went on to explain that they are employed full-time exempt, but no one checks up on them on a regular basis. Apparently, as long as they turn in some form of work every week, no one is any wiser as to how little time this company’s remote workers spend on the various projects they are assigned. You might ask yourself, how often does this really happen? I can only tell you that this is not the first time I have had someone approach me about moonlighting on another employer’s time and wages. It was as despicable back then as it is today. I can also remember scanning resumes on Indeed when I found more than one of our former employees listing that they worked for another company while they were remotely working for us. In part, it was the actions of the few bad apples that led us to develop new tools. In part, it was the wisdom in seeing how such tools could benefit all companies with or without remote workers. It is far time for companies to stop neglecting their remote workers and to start managing them. My first suggestion is to use a time and attendance tracker. A time clock, in and of itself, makes a person perform the physical act of clocking in and out. It is a simple tool but has a valuable function. Let’s expand that time clock to include a task tracker – a much more valuable tool. A task tracker will tell management exactly how much time a person is spending on each task that person performs. If the manager sees it only takes 20 minutes a day to perform the tasks they thought would take a full day, the manager will more than likely add enough work to keep the employee busy. If you want to be even more precise, then add a “pause” button to the task tracker to indicate interruptions that may make a task appear to take longer than it really does. The truth is, if you are neglecting your remote workers, you shouldn’t be surprised if someone else is showing them some love. My second suggestion is to use a tool for video monitoring and conferencing. You can coach and mentor the remote employee, share their screen and conference or huddle with others at the same time. Video monitoring can allow you to check up on your workers any time of the work day and can do this with or without their knowledge (depending on your state and local labor and privacy laws). If the worker was in the office with you, then you would certainly look over their shoulder now and again. A monitoring session can function in the same way. Video conferencing can also foster a sense of connectivity with the home office. Like a spouse, an employee who feels connected is less likely to cheat. Show your valuable remote workers a little love, and kick those cheaters to the curb.